Angela Kepler, a New Zealander, considers herself an “old fashioned naturalist”. Her multi-faceted career has included writing and illustrating natural history books (15) for the “intelligent public”, environmental consulting, photography, and lecturing on wildlife-oriented cruise ships worldwide. She holds a Bachelor’s from the University of Caterbury, New Zealand, a Master’s from the University of Hawaii (Manoa-Honolulu), a Doctorate from Cornell University (New York), and she spent a post-doctoral year at Oxford University in Oxford, England. 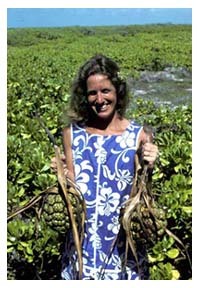 Angela has conducted ecological and conservation research in Hawaii, Alaska, the Russian Far East, the Caribbean, and on islands and atolls throughout the Pacific for more than 30 years. She has been actively involved in the presearvtion of many prime natural areas. For her unrelenting volunteer efforts with the Government of Kiribati, notably her assistance in creating the National Park and UNESCO World Heritage Site at Millenium (formerly Caroline) Island, she was declared an honorary Kiribati citizen by that nation’s President. She has discovered/co-discovered several species new to science: plants; lizards; and two bird species, both of which were named after her: The Pueto Rican cloud-forest Elfin Woods Warbler (Dendroica angelae), and an extinct Hawaiian rail (Porzana keplerorum). An energetic, award-winning photographer, backpacker, birdwatcher, and teacher, Angela has visited wilderness areas and national parks in nearly 90 countries. For many years, she has been a field ornithologist specializing in remote places. A gentle and kind woman, Angela is also a tough adventurer. She has camped for months at a time on unihabited coral atolls, in tropical forests, and on icy tundra. Her varied research sailings include: four months on a tiny cramped yacht, two months on Russia’s former #1 spy ship, and five weeks “knocking around the equitorial Pacific” in cargo and Fisheries Police boats (the only woman among 26 men). Angela has spent her career discovering, studying, documenting and helping to conserve biodiversity around the world. She has a special fondness for island ecosystems because of their uniqueness and rich biological diversity. She makes her photos available in the hope that others will be as taken by the beauty of the Pacific Basin as she has been.